If you're a fan of T-Mobile's coverage but are looking for a better deal, check out an MVNO. Mobile virtual network operators (MVNOs) are "alternative carriers" that lease coverage and network access from the "Big Four" carriers (T-Mobile, Verizon, AT&T, and Sprint) and offers similar services for less. T-Mobile, which has branded itself as the Uncarrier, supports a ton of MVNOs, so if you like the coverage of T-Mo provides in your area, you might be able to save yourself some money by switching to a cheaper alternative carrier plan. T-Mobile operates a GSM and LTE network across 700MHz, 1900MHz and the combined 1700/2100MHz (also known as AWS) frequencies. During its vast expansion of LTE throughout 2013, T-Mobile shifted its spectrum holdings in a way that better aligned itself with the network map of AT&T, making it easier for customers of that carrier to bring their phones over to T-Mobile without issue. As such, if you've got an unlocked T-Mobile or AT&T device, you should be able to use it on one of the following MVNOs. Consumer Cellular is a great place to start shopping for MVNO plans, as it offers plans starting as low as $10 a month backed by a 30-day risk-free guarantee to try out the service. You can build your own plan by combining your expected talk time with a Connect Plan that combines texts and web data into plans that start as low as $2.50 per month for 300 texts and a paltry 30MB of data with pricing tiers up to $40 for unlimited texts and 5GB of data. Consumer Cellular lets you change your plan any time and as often as you need with no additional fees or penalties. You also have the option to add and share your minutes, texts and web data with additional lines for just $10 per month per line, with free calls between all phones on the same Consumer Cellular account — a compelling low-cost option for families or accommodating friends visiting from out of country. Consumer Cellular has won awards for its outstanding customer service, offering flexible monthly plans with no contract. You're always in control of your plan, and you will receive usage alerts when you're approaching your monthly limits so you have time to adjust your usage or upgrade your plan as necessary. Consumer Mobile uses T-Mobile's network, so you're able to grab a free SIM card and use it in any previously used T-Mobile phone. Eco's a great carrier if you're looking for great rates on international calling, with unlimited international calling available for free on plans of $30/month and up. Plans start at $20 for unlimited talk, text, and 100MB of data. 2GB of data, unlimited talk, text, 2G data, and international calling is $30/month. All plans get voicemail, caller ID, call waiting, three-way calling, MMS (picture and video messaging), and domestic calling. Note: Eco mobile works with Sprint, Verizon and T-Mobile, so you must be sure you're subscribing to the right tier that supports T-Mobile. GoSmart Mobile keeps it real simple by offering four plans that will be especially compelling to heavy Facebook and Facebook Messenger users — all plans come with unlimited 4G LTE access to the world's most popular social media network. And those data numbers exclude your Facebook and Facebook Messenger data usage as well. If you're alright settling for 3G data speeds, GoSmart Mobile offers some really compelling plans for heavy social media users. GoSmart also offers monthly and prepaid options for international calling for just $10. You're able to use any T-Mobile network compatible device you already own. Simply buy a GoSmart Mobile Sim Kit for around $8, pick the plan that's right for you and you're good to go. All "Max" plans include unlimited music and video with over 50 services on your device that doesn't count against your high-speed data. Some notable services include Google Music, Slacker, Spotify, Hulu, Netflix, and YouTube. This is similar to T-Mobile's BingeOn service. Smartphone plans also include other great features like Wi-Fi calling, visual voicemail, and rollover data, but some features might not be available in some areas. If Hayai is sounding pretty sweet, you'll also want to know that it offers special rates for firefighters, EMTs, nurses, teachers, military (both active or veterans), as well as college students studying at accredited schools. You will need to upload proof of employment or student ID during registration to qualify for the discounts. All plans require you to bring your own device, and it also offers data-only plans perfect for tablets or LTE Hotspots, which it sells for $90. Hayai also offers broadband internet for residential and businesses as well as TV packages, and it seems to be very keen to keep building out its network — Hayai even says that gigabit data speeds may be coming soon! Jolt Mobile offers BYOD no-contract plans that start at $25 a month for unlimited talk and text and top out at $55 with 5GB of 4G LTE data. All monthly plans feature nationwide coverage, caller ID and voicemail. It also offers PayGO plans for those looking for flexible pricing options starting at $15 or $20 depending on whether you prioritizing texting or data. If you're interested in trying out Jolt Mobile, all you need to do is order a free SIM card when you sign up for your preferred plan. Unlocked T-Mobile phones should have no compatibility issues with the network, though Jolt cannot guarantee that all phones will work. While not a traditional MVNO, KidsConnect is worth mentioning because it offers a solution to a problem that is becoming more and more pressing for parenting in modern times: How to keep in touch and track your child via smartphone technology, but without just handing your young child untethered access to a smartphone. The solution is the KidsConnect KC1, an $80 GPS tracker with built-in speed dialing features for up to four numbers. This device offers real time tracking in Google Maps, as well as location history. If there's ever any trouble, the child can press the SOS button, which sends texts to up to four cell phone numbers, then starts autodialing each number until one is answered. Voice plans are all under $20 and since there's no texting or data access on the device, you never have to worry about overage charges. Parents have good reason to be wary about giving smartphones to their young children for the purposes of keeping them connected and safe. KidsConnect tries to allay those concerns and give parents the peace of mind they deserve. MetroPCS isn't technically a T-Mobile MVNO — it's actually owned by T-Mobile. It boasts a reliable nationwide network and monthly no-contract plans with 4G LTE data that start as low as $30 a month, taxes and regulatory fees included. All plans include Data Maximizer, which streams video at a resolution ideal for smartphone screens, which helps to keep your data usage last up to three times longer. Plans can be upgraded to include unlimited calling to Mexico, Canada, or the world with device protection plans and an offer for unlimited music from Napster (still a thing, apparently). Metro PCS offers all the latest phones from brands like Samsung, LG, and HTC, and also give you the option to bring your own device. SIM cards are available for $10 in store, so find the store nearest you. Mint Mobile is unique among MVNOs as it doesn't operate with traditional contracts. You pay upfront for your term, which can be 1 month, 3 months, 6 months, or 12 months, with "buying in bulk" saving you more money in the long run. It's owned by Ultra Mobile and uses T-Mobile's 4G LTE network. 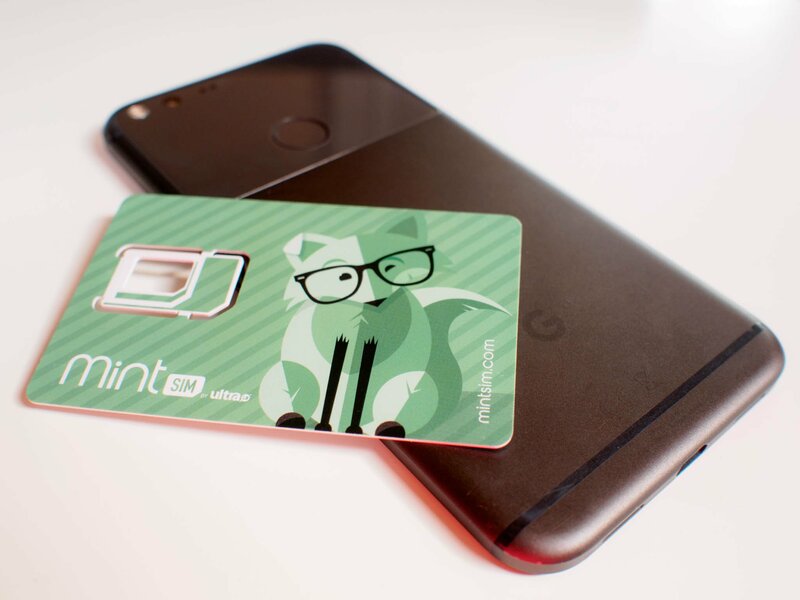 Mint Mobile lets you bring your own phone as long as it's compatible with T-Mobile's network. Net10 Supports BYOD for compatible T-Mobile devices. Click here to check if your phone is compatible for the switch. All smartphone plans come with unlimited talk, text, and 2G data. $35/month gets you 500MB of 4G LTE, but an extra $5/month gets you 3GB, and you can save $4/month if you sign up for Auto-Refill. Like some other MVNOs in this list, Net10 actually uses all four major U.S. carrier to power its network, which means that if you have a newer phone, you'll likely get great coverage throughout the U.S. — even if you don't have T-Mobile coverage in a specific area. Project Fi is Google's own alternative carrier option, which works by combining access to T-Mobile, Sprint, and U.S. Cellular's networks with a SIM card that can actively switch between the three networks without any user intervention. Plans start with the Fi Basics for just $20 per month which includes unlimited domestic talk and text. Data is bought at $10 per GB, and you're credited for any data you don't use at the end of each month making Project Fi one of the most flexible data plans in the country. Group plans are also available for up to five lines, where you'd share the same pool of data. If you're coming over from Sprint and want to bring your own device, it would have to be a Nexus 6P or Pixel as Google only supports a limited number of Google devices. You're also able to buy or finance a new phone through Google if needed. Red Pocket uses all of the big carriers' networks, advertising that virtually every phone in America works with its services. That means if you've got a T-Mobile compatible device, you should have no problems bringing it over to Red Pocket Mobile. Red Pocket has two basic plans to choose from and you can add to the second. The first plan is $10/month and gets you 500 minutes, 500 texts, and 100MB of 4G LTE. You can then buy extra texts, minutes, and LTE. The second plan is $19/month and gets you unlimited talk and text, with 100MB of 4G LTE. You can upgrade to unlimited 2G data with 500MB, 1GB, 3GB, or 5GB of 4G LTE for $6 to $41/month. Low-cost plans starting at just $15 a month. For that, you get unlimited talk and text, but you will have to rely on Wi-Fi for data. Plans with cell data start at $20 a month with 1GB at LTE speeds. Shop its plans and find the one that's right for you. You remain in control of everything via the Republic Wireless app, which lets you see how you're doing on your monthly limits and lets you adjust your plan to suit your needs. Republic may let you bring your own device if it falls on its list of compatible phones. You may also by a new Android device from them when starting a new account. Simple Mobile lives up to its name by offering easy-to-understand, no-contract wireless plans that let you bring your own phone and keep your old phone number. Simple Mobile uses T-Mobile's nationwide network, so any T-Mobile compatible phone or unlocked GSM device that operates in 850 and 1900 MHz bands should work fine. You buy your access to the network in advance which provides you with unlimited talk and text for as low as $25. From there, Simple Mobile offers reasonably priced plans which include a set monthly allotment of 4G LTE data and unlimited data at 2G speeds after that. Then there's the "Truly Unlimited" plan, which offers unlimited 4G LTE speed data for only $60 a month. All unlimited plans now come with unlimited international calling to Mexico, Canada, China and India, along with 60 other countries around the world. You must re-up with Simple Mobile after every cycle, or you can save some money and sign up to auto-renew your plan on select plans. SpeedTalk Mobile offers prepaid, no-contract mobile plans marketed towards seniors that don't use their phones too often, with pricing that starts as low $5 a month. It supports any unlocked T-Mobile, AT&T, or GSM phone and with SpeedTalk Mobile, you only ever pay for the services you use. It offers three different types of plans: Special Plans with set amounts of talk/text/data over 30 days, Marvel Plans which include the option to rollover your unused balance to the next cycle if you opt to refill, and Pay As You Go plans. So, for instance, if you choose to only pay $5 at the start of the month, which works out to 250 minutes, or 250 texts, or 250MB of data for 30 days. That translates to $.02 per minute, text, and MB of data. This rate is offered across the board, so if you think you'll need more simply spend more on your plan. If you've been thinking of helping your parent or grandparent get a smartphone, but don't want them to be overcharged for features they won't use, SpeedTalk Mobile might be able to help. Straight Talk is owned by TracFone and is that cell phone section sold at Walmart. It features the latest phones and lets you bring your own T-Mobile device — or really any device since it uses all four of the big networks for coverage. Plans start at $30/month for 1500 minutes, unlimited texts, and 100MB of data. $45/month gets you 5GB of 4G LTE and unlimited talk and text, as well as unlimited 2G data. TelCel is a Mexican wireless telecommunications company that offers affordable plans that work in the U.S.A. and Mexico. Plans start as low as $25 a month for call and text only, but your best deal is the $60 a month deal that comes with unlimited 4G LTE data. All plans come with unlimited calls and text messages. It also offer a $20 travel plan that gives you 2GB of data over a 7-day period. If you want to bring your own device to TelCel you can buy a SIM card as long as your phone is compatible with its network. This carrier is especially convenient for anyone who frequently visits Mexico. Tempo Telecom offers no-contract plans with no credit checks or hidden fees. All plans include talk, text and data, albeit at different tiers to accommodate all budgets. Monthly pre-paid plans start as low as $9.95 a month for 50 minutes which are spent on calls, texts and data collectively. Top-ups are available throughout the month as needed, and all of Tempo's plans carry over your unused minutes to the next month. Pay-As-You-Go plans are even more flexible, letting you top up your phone with minutes as you need them. If you don't want to worry about counting minutes and texts, unlimited plans are available with set data limits of 250MB, 1GB, and 2.5GB. Tempo sells a range of Blu Android devices, but you should also have the option to bring your own T-Mobile device to Tempo Telecom. Find a dealer near you for more information. The People's Operator USA (TPO) separates itself from other alternative carriers by donating a portion of your monthly bill to a cause of your choice. Plans run as low as $10 a month (with autopay enabled) with plans $26 a month and over including unlimited talk and text. Whichever plan you choose, TPO will send 10% of your bill to your choice of over 30 different charity causes including ASPCA, American Lung Association, and Habitat for Humanity to name a few. TPO uses a combination of Sprint and T-Mobile, so check to see if TPO service is available in your area. Ting says it offer mobile that makes sense, so it only wants you to pay for the stuff that you used. With pretty affordable rates for talk, text, and data, you'll be sure that are entirely customizable to your needs without locking you into a contract. Mostly use data and rarely make calls? Create a data-heavy plan that works for you. Lines start at $6 with affordable options for adding monthly minutes, texts and data allotments. Voicemail, picture and video messaging, 3-way calling, caller ID, tethering, hotspot and more are included for no additional fee. You can have as many devices on your account, which all use the same pool of shared talk time, texts and data. Ting knows your phone usage changes from month to month, so it tallies up your usage at the end of the month and only charge you for what you used. If transparent pricing and billing is what you crave, Ting might be right for you. Ting allows you to bring your own device. Check your phone's compatibility here. TracFone has been around since 1996 and owns multiple MVNOs, which it operates on various networks. Its cheapest data plan with a gig or more is $17.50/month for 1GB of 4G LTE, 750 minutes, and 1000 text, BUT you have to sign up for a 60-day term, so that 1GB has to last you 2 months. An extra gig of data is $10, which expires at the end of your term. TracFone is perfect for folks who constantly travel to the U.S. and don't want to buy a local SIM or pay outrageous roaming fees. Ultra Mobile is a great MVNO option for those who value staying connected with friends or family overseas. All of Ultra Mobile's plans includes unlimited talk to international destinations, along with unlimited international texting. Plans start as low as $19, with unlimited data included on all plans $29 and over. You have the option to prepay for your plan on a monthly basis, or pay for multiple months in advance and save even more. Cell phones from nearly every manufacturer will work on the Ultra Mobile network as long as they are GSM-compatible and use a SIM card, which includes any unlocked T-Mobile phones you may have. To get started, you can find an Ultra Mobile store near you or buy your SIM card and plan online. Univision Mobile is another carrier that offers deals specifically marketed to those who frequently call family back home in Mexico or other countries in Central America. All plans include unlimited global texting as well as unlimited calling to landlines in up to 14 international destinations, and start as low as $19 a month. Univision Mobile lets you bring your own phone from nearly any manufacturer as long as they are GSM compatible and use a SIM card. That includes any unlocked T-Mobile phones you may have. If keeping in touch with friends and family in Mexico or elsewhere is most important to you, Univision Mobile is the MVNO for you. US Mobile believes mobile providers should offer plans that are simple and offer great value. As such, you're able to build your own plan based on your specific usage needs. Barely use your phone to talk? Minutes start at just $3 for 100 minutes. It's an ideal choice for those who want to be in full control of their mobile plan. US Mobile also cares about your privacy, so all customers get a free VPN with 100GB of monthly bandwidth. It's also partnered with a number of universities and colleges to not only offer student discounts, but also sell SIM cards at select student services offices. It says that any unlocked device you own should work on its network, but that will especially be true for any unlocked T-Mobile phones you plan to use. You're able to add up to 10 lines to your mobile account to cover your entire family, with the option to top up your account with more minutes, texts or data as you need. If you've shopped at Walmart recently, you will have noticed that it, too, offers its own mobile plans using T-Mobile's network. Its plans start at $24.88 a month for unlimited talk and text, and just $5 extra to get unlimited talk, text, and data with 1GB of 4G LTE data. The best value is the Plus plan, which offers unlimited talk, text, and data with up to 10GB of 4G LTE data and also a free movie rental every month from VUDU, Walmart's on-demand video service. As the name implies, Walmart Family Mobile offers great plans targeted at families looking to save on their wireless bills. You save $5 per month for every additional line added to your plan up to five lines. Walmart has phones for sale, but you can also buy a SIM card kit for $25 and bring your own compatible, unlocked device — any T-Mobile phone should work just fine. Zing PCS or Zing wireless is an MVNO with decent prices and a website that looks like it was made in 1999. Data plans start at $28.99/month for 1GB of 4G LTE, unlimited talk and text, unlimited international text (picture and video messaging not included), and unlimited 2G data. Zing also supports and provides service for Lifeline, the FCC program that helps make communication services more affordable to low-income individuals and families. ZIP SIM offers short-term contracts that are targeted at travellers in the USA. All plans include unlimited nationwide U.S. calling, unlimited global texting while you're in the U.S., along with unthrottled 4G LTE and hotspot tethering included at no additional cost. Talk, Text and Data plans start at $25 for seven days of service and max out at 30 days of service for $55. There are also data-only plans available that are valid for 14 to 30 days and use T-Mobile's nationwide 4G LTE network. ZIP SIM is a great option not only for international travellers visiting the U.S. looking for a hassle-free way to use their own phone on their travels, but also for international corporations sending employees to the States for business, or for Americans looking for a backup phone for emergency situations. Activating your phone is as simple as inserting your ZIP SIM card and powering up your phone. Your SIM will activate instantly and automatically, and then text you your new U.S. phone number. Since this service is typically used by International travellers who might not know if their phone is compatible with T-Mobile's network, ZIP SIM recommends using WillMyPhoneWork.net to determine whether your device supports the right frequency bands.